Add up to 7 peripherals quickly and easily with the Sabrent 7-Port USB 3.0 Hub. The thin, lightweight design makes this hub a great travel companion to expand one USB 3.0 port into seven. Especially great for notebooks which come with only a few ports in an era when you need to attach many USB devices at once, such as a printer, card reader, cell phone, iPod, thumb drive, mouse, keyboard, or an external hard drive. Fully backwards compatible with the USB 2.0/1.1 products. Plus, each port has its own separate power switch so you can control each port independently. Technology seems to advance at ever increasing speeds. With the recent release of SuperSpeed USB 3.0, you can now transfer data at up to 10 times the speeds of the older USB 2.0 standards! Speeds of 5Gbps are a vast improvement over USB 2.0 that only supports up to 480Mbps. 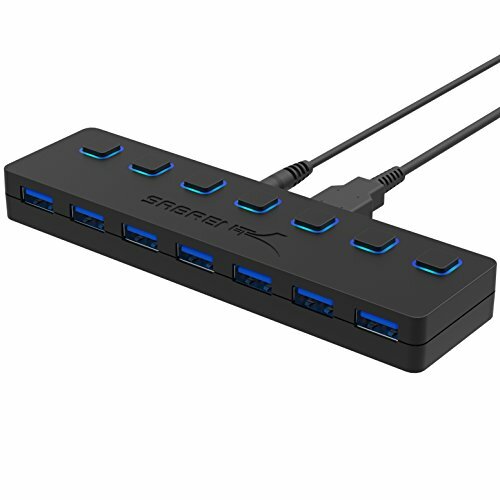 The Sabrent USB 3.0 Hub is a great tool to expand a single USB 3.0 port into 7 ports, so now you can connect all of your USB devices at one time. Plus, its small and elegant design has been configured to be as thin as possible so as to not take up precious space. Yet, it is still backward compatible with your older devices, so you can still use it in conjunction with USB 2.0 devices. 2.4Ghz wireless devices such as keyboard/mouse receivers, Bluetooth, WiFi adapters and logitech unifying receiver, may not work in close proximity to USB 3.0 devices or hubs. Connecting to a USB 2.0 port is recommended. We not recommend using this 7-Port USB 3.0 Hub to charge power hungry devices sach iPad and tables (it might not charge them or charge them slowly).